Make fun of it as much as you want, but the iPad Pro remains one of the better tablets money can buy. Sure, it is pricey and yes, it is bigger than the average slate, but one must think of Apple's tablet as a high-grade instrument – as a powerful tool that professionals and creative individuals would truly appreciate. And let's be honest – none of us would mind receiving an iPad Pro as a gift for the holidays. Whether you're getting an iPad Pro for yourself or for a loved one, you might want to get a case for it as well. Not because the tablet might break someone's toe if it gets accidentally dropped. Bulletproof the iPad Pro is not, and slipping it into a protective case would help it withstand the tests of time. Besides, protecting pricey investments is always a good idea. But what are the best iPad Pro cases in existence, beside Apple's own iPad Pro offerings? That's the question we felt like answering today, so we combed the internet in search of the best iPad Pro case. What resulted was the list of cases in the slideshow below. Flip through it and see what are the best iPad Pro cases right now. 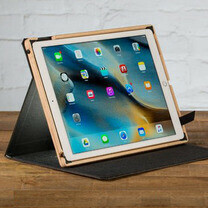 When closed, this iPad Pro case by Speck protects both the front and the back of the device. When opened, the case doubles as a stand, allowing you to easily enjoy a movie or to conveniently type an email on your iPad Pro. A secure closure clasp holds the cover in place. The accessory comes in classic black, but this pink/grey combo could be yours as well. A weak spot, however, is that it can't hold an Apple Pencil. The flashy colors are not all this iPad Pro case has to stand out with. The Gumdrop Hideaway has both a built-in kickstand and a pocket designed to hold the Apple Pencil. That aside, the accessory resists serious impacts thanks to its dual-layer silicone/polycarbonate construction. This iPad Pro folio case has "style" written all over it. Handcrafted in San Francisco, it features an elastic loop to hold your Apple Pencil or other stylus device, while magnets tell the tablet when it is time to wake up or sleep. Do keep in mind that it takes about 2 weeks to manufacture each of these beauties. One of the more rugged iPad Pro cases comes from Urban Armor Gear. It is made of an impact-resistant soft core and a grippy exterior piece. To place the tablet on a flat surface, simply pop out the aluminum stand. You get a holder for the Apple Pencil as well, in case you have one. The case is also compatible with the Apple Smart Keyboard. It is expensive, we know, but this luxury iPad Pro case by Pad & Quill is handmade using premium materials, such as birch and linen. Special attention has been paid to the iPad Pro's sound reproduction, as audio travels through custom sound-enhancing channels. We're pretty sure that some don't want to obscure their iPad Pro's natural beauty. To them we'd recommend this transparent iPad Pro case from Luvvitt. It is durable, with reinforced corners, yet inexpensive at the same time. The iPad Pro is not water resistant, so using it near the pool or the ocean isn't a very wise idea. This waterproof iPad Pro case, however, makes it much safer to use the tablet near liquids. By "waterproof" we mean that the accessory is IP68-certified, meaning that in theory, it could withstand a drop underwater at up to 2 meters. If leather is what you're into, we give you this stylish leather case by Kavaj. Yes, it is made of real cowhide leather, colored in either brown or black. The cover folds to convert into a stand, allowing you to place the iPad Pro on a flat surface when typing or watching video. ..."one must think of Apple's tablet as a high-grade instrument"... Nick T - you must think of iPad Pro as mini tv and that's all it is. If the iPad isnt big enogh, lets put a huge case on it, it wil.